Big Mouth House, 9781618730978, 256pp. Wasp's job is simple. Hunt ghosts. And every year she has to fight to remain Archivist. Desperate and alone, she strikes a bargain with the ghost of a supersoldier. She will go with him on his underworld hunt for the long-long ghost of his partner and in exchange she will find out more about his pre-apocalyptic world than any Archivist before her. And there is much to know. After all, Archivists are marked from birth to do the holy work of a goddess. They're chosen. They're special. Or so they've been told for four hundred years. Archivist Wasp fears she is not the chosen one, that she won't survive the trip to the underworld, that the brutal life she has escaped might be better than where she is going. There is only one way to find out. "Archivist Wasp is a gorgeous and complex book, featuring a deadly girl who traverses an equally deadly landscape. Wasp won me over, and she's sure to find fans among teens and grown-ups alike." "A tremendously inventive and smart novel. 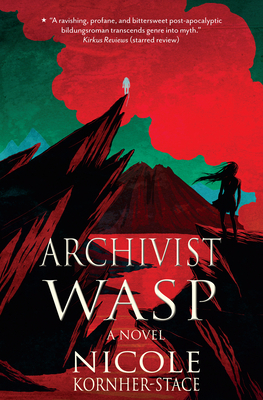 Archivist Wasp is like Kafka by way of Holly Black and Shirley Jackson, but completely original. Highly recommended." "A gorgeous, disturbing, compelling book with a smart, complicated heroine who bestrides her post-apocalyptic world like a bewildered force of nature. Reading it was a wild ride and a thoroughly satisfying one." "One of the most revelatory and sublime books I've ever read, Archivist Wasp is a must-read for fans of post-apocalyptic fiction. Kornher-Stace is a genius, and I can't wait to see what she does next "
"Brutal post-apocalypse meets sci-fi techno-thriller meets a ghost story for the ages in this astonishingly original novel from Nicole Kornher-Stace. You've never read anything like Archivist Wasp, but once you have you'll be clamoring for more." "Sharp as a blade and mythically resonant, Archivist Wasp is a post-apocalyptic ghost story unlike anything else I've read. Trust me, you want this book." "Archivist Wasp turns destiny on its head, and it re-invents the world you know to do it. Strong. Fast. Addictive." "Goes off like a firecracker in the brain: the haunted landscape, the sure-footed, blistering prose -- and, of course, the heroine herself, the most excellent Archivist Wasp." Nicole Kornher-Stace: Nicole Kornher-Stace was born in Philadelphia in 1983, moved from the East Coast to the West Coast and back again by the time she was five, and currently lives in New Paltz, NY, with one husband, three ferrets, one precocious preschooler, and too many books to count.